When you buy Therasauna, you buy a complete package of assembled quality components providing the best infrared sauna features that go beyond individual elements. From the type of emitter (ceramic), the type of wood used in the construction of the sauna (aspen), the infrared micron output (in the beneficial 9.4 micron wavelength range), where it is made (USA), and the standards under which it is approved (CSA, CE), to the patented control system, years of development have resulted in the ultimate infrared sauna cabin. Non-toxic aspen wood is used in the interior. The solid aspen wood bench has a curved side and a flat side, so seating can be adjusted to your preference. Even the backrest and accessory such as cupholders, magazine rack and footrests are made of aspen wood. The bench is also solid so you sit comfortably and feel the support since this bench alone weighs more than some competitors side wall. 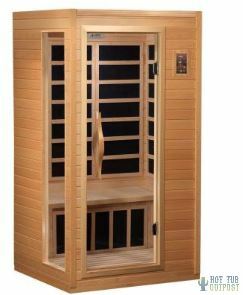 The Therasauna is a solid, heavy duty sauna made of aspen wood vs. cedar used in many infrared saunas. Cedar wood can produce toxins and depending on the type of cedar can be considered everything from an irritant to a sensitizer and can even cause a runny nose, adverse effects on asthma, nervous system and even kidney problems (diureses) as quoted on the Wood Database. Note that very few woods are actually toxic in and of themselves, but many woods do have the potential to cause allergic reactions in sensitive individuals. Hot Tub Outpost offers online direct discounted pricing on Therasauna and the affordable Better Life infrared saunas. Easy assembly and they plug right into your power outlet. 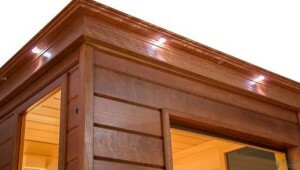 See the whole current infrared sauna lineup at www.HotTubOutpost.com.